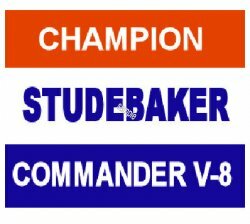 STUDEBAKER Champion Commander sticker - $10.00 : Bob Hoyts Classic Inspection Stickers, Add a Final Touch to your Restoration! This attractive Classic sticker identifies Studebaker owners from the 1950's and 1960's. It typifies the Studebaker Champion and the Commander V8.